In the USA, it has been claimed that the first ever crash involving a motor vehicle was in 1896: A person driving a car in New York City crashed into a person on a bicycle. Bang! In the UK, it was a crash on 17 August 1896 of a car into a person standing in front of it. Bang! I created the space for cycling website, from which this website copied its original content, after reading Sara Dorman‘s article titled ‘Space for cycling: more radical than you realize‘ on 19 July 2013. Tweets by the Cycling Embassy of Great Britain and the London Cycling Campaign (see below) at the same time started rallying support online, and then offline: on the streets of London, following the killing of yet another person on a bicycle under the wheels of a lorry. The killing came precisely when the UK Government was making road-building funding announcements without much in them for safer cycling infrastructure. People expressed their frustration at the lack of progress. Many people who had been following the ‘Get Britain Cycling‘ inquiry and its report issued in April 2013 expected a better, more robust response from the UK Government. Instead, the Government prioritised road building tailored to the needs of people who choose to drive a car or lorry. This upset many campaigners and made some cross at the UK government’s lack of progress on road safety in June 2013; and again a month later. Each time a person riding a bicycle in London was killed during the summer of 2013, a protest ride was organised by the London Cycling Campaign. The rides became more and more popular: first 1500 people, then 2500 (with just 24 hours notice! ), and on 2 September 2013 over 5000 people. During the local elections, The Mayor of London had signed up to ‘Go Dutch‘ which, when fully implemented properly, would greatly increase road safety and choice. However, the progress made to date (mainly dangerous blue-painted bicycle super-highways) has not been enough to stop the killing. As the brand ‘space for cycling’ got more and more popular nationally, I decided in early September to make that website lighter – with a simple home page and links to various campaign groups and cycling organisataions around the UK. This website, pedaller, then became the place for me to put my thoughts down on paper pixels. 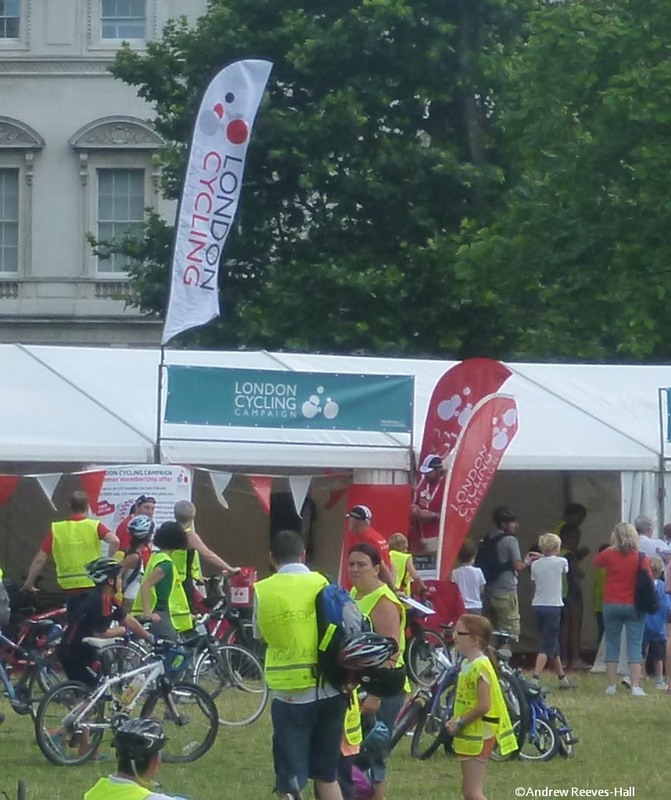 LCC were at the 2013 RideLondon event. Note: This website supports the aims of the LCC in promoting space for cycling but is otherwise not affiliated with them. A twitter account for the Space For Cycling website is at @SpaceForCycling. People on twitter are using hash browns tags to track the latest info about the topic: The #SpaceForCycling hash tag was first used on the 9th of July 2013 by the @GBCycleEmbassy (founder: @LowFidelityJim). Later on the same day, 9 July 2013, the London Cycling Campaign tweeted the first #Space4Cycling hashtag and said to use it to promote their protest ride on 12 July. It wouldn’t be the Internet if there wasn’t also a Facebook page for ‘Space for Cycling’ that you may ‘like’ or not as you wish. The demand to create ‘Space for Cycling’ is a strong one, made by people like you communicating with your elected representatives. Let’s not forget: The Joy Of Cycling. *For the avoidance of doubt, please note that this website is not officially affiliated with the London Cycling Campaign (the editor has been invited to enjoy a coffee with them next time he is near their offices though!). None of the views expressed here are theirs unless stated otherwise. You can find out their latest news on their blog: click HERE.